My name is Ni Wayan Yuniari Putri, I am from Karangasem but I was raised in Ubud. I was a student of 1 Year Professional Program CAMPUHAN College 2013-2014. 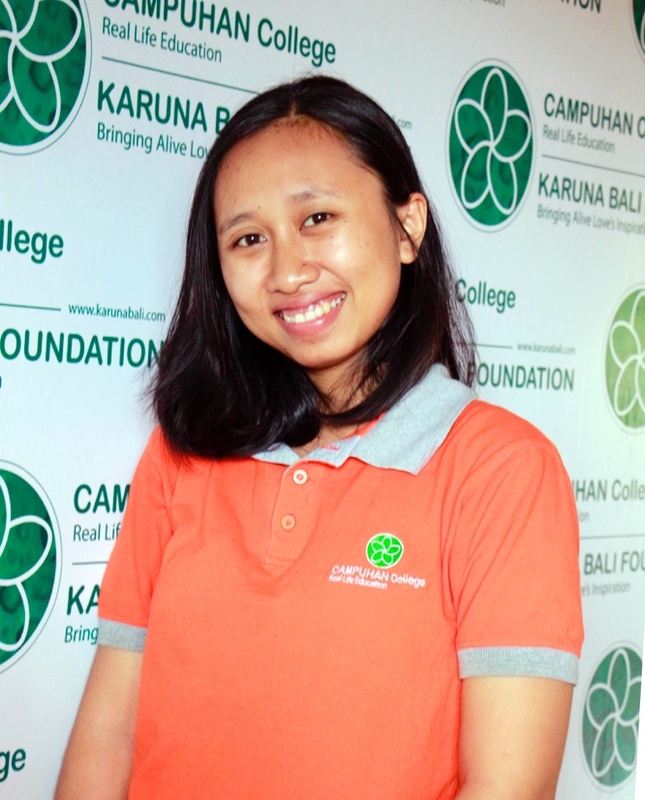 I am so happy I got a chance to study after I graduated from senior high school, and my happiness is a double because after I graduated from CAMPUHAN College I got accepted working at Karuna Bali Foundation as Media Production staff. I have been working for 2 years. I feel like KB “Karuna Bali Foundation” is my second home. Why? Because I am not just working here, me and all of my friends who work here are given chances to improve ourselves and grow more, we learn together to improve our English skill, we have given so many workshops to learn more about ourselves and we are close just like a family. Being able to be the part of Karuna Bali Foundation is an honor for me.